GALION — Four years ago, a mission trip to Haiti changed the life of Galion’s Holly Christini. A labor and delivery nurse at OhioHealth Hospital in Shelby, Christini was looking for a way to help and serve on a larger scale than she had been involved in before. She felt called to help children, but hadn’t been led in a specific direction. She signed up to attend a mission trip to Haiti with members of Galion Missionary Alliance Church. In preparation for that trip, Holly met church members who were involved in a program that dealt in international fostering of children with medical needs. After returning from the mission trip and seeing those much less fortunate and witnessing their lack of suitable care, Christini no longer had questions about where her help was needed. Four weeks later, her first foster child arrived in the United States. Baby Maria (Marietou) was only four months old when she left her parents and homeland of Burkina Faso, Africa. She had a severe cleft lip and palate that would have remained untreated and most likely sent Maria to an even lesser life than what all ready exists for those in her region of Africa. Maria spent months in the Christini home, and her medical care was donated by Akron Children’s Hospital. But all of the in-home care, gas, and expenses fell on Holly and her husband Mick. Knowing that they wanted to take on this outreach for the long term, the Christinis decided they would need to offset their expenses and provide for the children she knew would be coming into their home in the future. From there, the Into the Heart Into the Home non-profit organization began. Since then, three more children have stayed at the Christini home while receiving medical care, and then returned home. In 2014, 13-year-old Antoinette came to the United States to have her crooked leg fixed by physicians at Lima Memorial Hospital, who donated their services. She is now back home in Africa and attending a sewing school thanks to a sponsor in the United States. Attending school and learning a trade will secure a future for Antoinette. Little Ruth arrived in 2015 at only 18-months-old. She had a cleft palate just like Baby Maria. Her care was also provided by surgeons at Akron Childrens Hospital. Ruth will soon be in pre-school where she lives along the Ivory Coast with the donation of a sponsor from the United States. In 2016, handsome Yvan was the first boy the Christinis have fostered in their home. He has a bright smile and is full of plenty of boy energy, but he suffered from a club foot. His care has been more complicated than the children to come here before him. Yvan’s first surgery was done at Lima Memorial Hospital, but it wasn’t considered a success. Thankfully, the work that Holly has done to foster these international children has opened doors to new friendships with others who are doing the same. With some research and suggestions from those friends, Christini was put into contact with Dr Jose Morcuende at the University of Iowa. Dr. Morcuende is part of a team that uses a special technique to correct club foot that has shown a high success rate. As with the other physicians that Christini has found since she began her mission, Dr. Morcuende donated his services to help Yvan. Currently, Yvan is back in the United States staying with another host family after returning to the Ivory Coast for four months. He came back for a four-month check up and was found to not be progressing as needed. He is currently undergoing physical therapy with the hopes that he will need no further treatment. The Christini family is now playing host to Ainata. Her exact age is unknown, because her village in remote Burkina Faso keeps no such records. She is 4-5 years old. Ainata, like Yvan, came to the United States to be treated for club feet. She also traveled to the University of Iowa for treatment, which included multiple castings of her feet and legs every two to three weeks to ready them for surgery. Now, nearly 10 weeks post surgery, Ainata has a new life ahead of her. She is now in walking casts and learning to ride a bike. She is also attending school at St. Joseph’s School in Galion. Funding from Into the Heart Into the Home is paying for her school for the next four months before Ainata returns home to Burkina Faso. Looking to the future, Christini has no plans for hosting a child in 2018. She is looking to take some time off to focus on the non-profit organization and build funds to be better prepared for another child to host in the future. According to Christini, the largest expenditure she faces is airfare for transportation back and forth for the kids and for her if she needs to accompany them. Thankfully, she was put into contact with an organization called Lifeline Pilots which has been a tremendous help stateside. They are an organization of pilots who provide free airfare for financially distressed passengers with medical conditions like the children Christini hosts. Another blessing for the children is Galion dentist Dr Tom Fellner. He provides free dental care for each child they host. Yvan and Ainata from the Ivory Coast and Burkina Faso in Africa are being hosted by the Christini family of Galion while they are undergo treatment for medical needs that would remain unattended to in their home country. 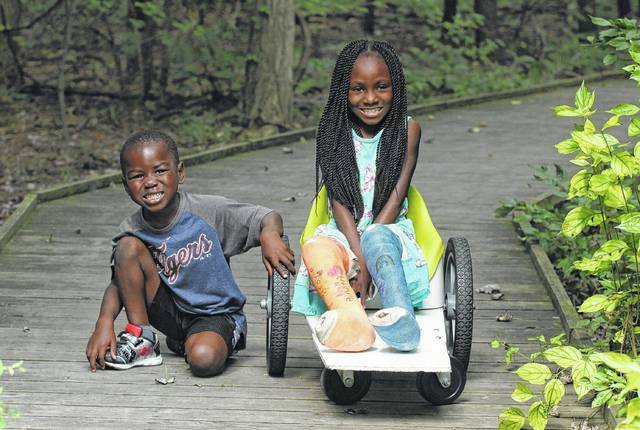 https://www.galioninquirer.com/wp-content/uploads/sites/38/2017/09/web1_kids2.jpgYvan and Ainata from the Ivory Coast and Burkina Faso in Africa are being hosted by the Christini family of Galion while they are undergo treatment for medical needs that would remain unattended to in their home country. Contact Erin Miller at 419-468-1117 x-2049 or emiller@aimmediamidwest.com.